The 2.6 update of DoLeague is now available for all your tournaments and championships. Many times the sum of small changes can be much more important than a new feature. So this time we bring you a long list of small and new features designed to improve your experience in organizing tournament with us. Then we summarize each and in the coming days we will talk about them with more details on the blog. 1. Features who help the organizer. The administrator can end a tournament before you have all the results. The tournaments can be reset to the status just before started, but can not be undone. 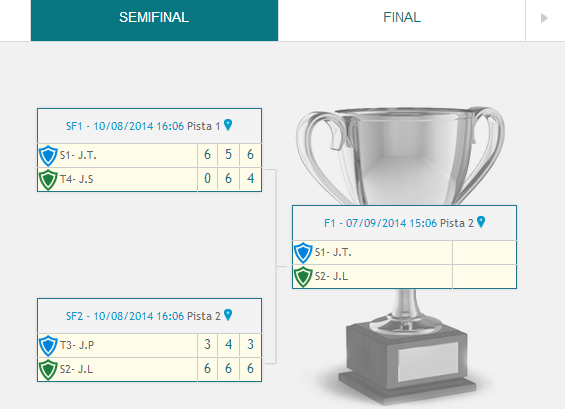 In the tournament information there is a new optional field to fill the street address of the tournament. The tournament dates are changeable at any time, because there are always unexpected events. There is a new “Join” button on the tournament information, more visible. Administrators can move participants from one category to another in the same tournament without generate a notification to the players. Also they can add, edit and remove categories anytime just before the start of the tournament and when registration is open. You can change from fixed to open schedules until close registration. No need to make hasty decisions. 2. Features designed for participants. Players can join to several categories in the same tournament. There is a new online sport , League of Legends, where the participant register with his account ID. For online registration, the system only required one captain email for each team. No more fake emails! On the matches list appear the names of the opposing teams, and clicking on the tournament name leads directly to the appropriate calendar. There is a new link to the match on the “tournament brackets”. Improved information on the income statement to the participants: awaiting confirmation, confirmed, etc. Were added login buttons to calendar to make it easier to find the links to upload results. Colors and the result were added to the tournament matches list played and finished. Create a final phase knockout from any other tournament with one click and import the teams into it. Have, if they wish, a custom short urls for the tournaments. You can start a new season for a tournament before it ends, and you can start adding (import) new teams immediately. From this version can use animated GIFs as images of sponsors. The limitation of two parent companies and images too small is over. When filling a result of a match and returning to the calendar, will remember the round, category and division in the I was. “Publish” action is now called “Open Registration”, this does not change anything but yes helps new users. On the start page of the tournament the administrator can decide to send notifications to the teams or not. Updated “Open registration” page, applying the changes of the latest versions. Administrator can modify playoff rules and score tournament at anytime. Now is possible to edit team names for tournaments at anytime even if the championship has started. As you see, many little things that add flexibility to the management of a tournament. Although we told you that we will explain in more detail each of these developments in next blog articles, as always, you will not have to do anything to apply these advantages to your championships, only enter into the web and start to enjoy automatically.